Lock in a great price for SpringHill Suites by Marriott Moab – rated 9.1 by recent guests! The breakfast was great!! The location was fabulous. Loved how you could sit in the hot tubs- any of the multiple ones there were, and have a great view up the canyon!! Brand new hotel in great location just outside Moab and right down the road from Arches National Park.. Breakfast was very good with a big selection. The bed was very comfortable! Pillows great. The size of the room was really nice! Glad there was a small window to open. Liked having two tv's. Having a refrigerator & microwave was an added bonus!! Great place to stay with a family! The rooms are very large, plenty of space for our big family. The pools and hot tubs were a huge hit with the family too. Delicious breakfast options both mornings we stayed there. Great location, very close to Arches National Park. Absolutely superb! Spotlessly clean room, lovely comfortable beds, great facilities and bathroom. We booked a 2 queen room which had a separate seating area and a view of the Colorado River and red mountains behind. The room was quiet and almost brand new. Highly recommended. When you walk in you get the sense it is brand new and not a year old. SpringHill Suites by Marriott Moab This rating is a reflection of how the property compares to the industry standard when it comes to price, facilities and services available. It's based on a self-evaluation by the property. Use this rating to help choose your stay! One of our top picks in Moab.Located in Moab, SpringHill Suites by Marriott Moab offers 3-star accommodations with a fitness center. This 3-star hotel features free WiFi and a garden. The hotel provides a hot tub and a 24-hour front desk. All guest rooms at the hotel are equipped with a seating area and a flat-screen TV with cable channels. Featuring a private bathroom, rooms at SpringHill Suites by Marriott Moab also provide guests with a mountain view. Guest rooms will provide guests with a microwave. The accommodation has an outdoor pool. Cycling is among the activities that guests can enjoy near SpringHill Suites by Marriott Moab. Mesa Arch is 10 miles from SpringHill Suites by Marriott Moab. 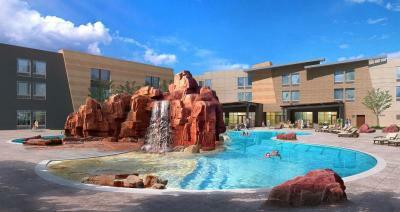 When would you like to stay at SpringHill Suites by Marriott Moab? This suite features a seating area, flat-screen TV and microwave. House Rules SpringHill Suites by Marriott Moab takes special requests – add in the next step! SpringHill Suites by Marriott Moab accepts these cards and reserves the right to temporarily hold an amount prior to arrival. I booked this hotel because I liked the pictures of the room. It looked really spacious and bright! When we entered our room we found that it didn't even look like the photo's on booking.com. We went downstairs and showed the photo to the person at the desk. She assured us that no room looked like that and also that all rooms where the same in size. A few days later we found that that simply was not true as there where rooms with more space. It is absolutely possible that those rooms where more expensive but they where pretending everything was equal and did not even offer this as an option. We where with 3 adults and one baby and it was a tiny room compared to what was shown on booking. I explicitly explained in my additional information that we sleep with the windows open. They never responded to that. If they would have told me they actually don't really open, just 4 inches, I would not have stayed here. Thank you for the headache we developed during our stay here! We talked to the manager about this issue; false information online and in our eyes she was not taking it seriously. What we also did not like was the fact that AGAIN everything was disposable at breakfast. You are close to National Parks, want to preserve nature and yet everyone is trowing away tons of plastic and cardboard. The manager told us that was because they didn't include a dish washer when the hotel was build. The breakfast item during the week where good but then suddenly in the weekend they changed to having no cheese, ham, fruit etc but put down a waffle iron and that's about it. WHY? Their answer: it's the menu. I believe this is a cheapo solution :) Also, the lay out at the breakfast area is horrible, way to small. I would not recommend staying here although the location is nice. But I'm sure you can find something better that'll also looks like what you've booked! The pool being freezing the last part of our stay due to generator/heater that went out, breakfast hours were shorter than I have experienced in the past, and the breakfast line could be expanded and have two areas for serving. The doors for adjoining rooms were paper thin. We could hear our neighbors in their room just talking. The staff offered to talk to them but we didn't want them to feel bad so the hotel moved us to another room with no problem. We also didn't like FOX news on all the TVs at breakfast. Other than that it was a beautiful hotel. The only thing I could add would be to upgrade the brand of toilet paper!! no vegetarian sausage. and the food could have been a little warmer. Breakfast was great. Many choices. Noise between rooms was awful. Could hear people above me And both sides of the rooms both nights. Poor quality of noise canceling between rooms. The TV did not allow us to use a different input in order to hook up an x-box. One of the days it rained and it would have been nice for the kids to play the games. I really liked the hot tubes and pool area around the building. The basketball area was used a lot by the families that were staying there. There was a really friendly atmosphere. Breakfast time.The helpers started cleaning the breakfast area way before 10am and make me feel in a rush to finish my meal.